After the unexpected and heart-breaking death of my dog, Dusty almost two weeks ago, the wife and I decided to get another dog. Since she wanted a female and I wanted a male, we ended up getting one of each. They are Pembroke Welsh Corgis and boy are they a handful at this stage. On the left is the female, Sandy. Her full name is Sandrine Liliane. On the right is the male, Janus Argus Griffinus, or JAG. We just call him Jaggy, though. They are brother and sister and are 11 weeks old. Just when we think they are getting the idea that outside is the potty area, we turn around and find a surprise on the carpet. And, man...do I need some sleep. Congratulations on the two new family members, they're a great looking pair of pooches. Condolences on your loss, congrats on the additions. The potty training is the easiest..then comes the chewing stage, which I think is the worst, stock up on chew toys..then comes the waking up in the middle of the night to go OUT and go potty. We're going through the let's learn why one of us has this part and the other has that part. We have a 7 yr. old male and a 9 mth. old female. The male has been fixed but the female hasn't yet. As you well know this doesn't make any difference on the desire. All I can say is they're getting more exercise lately. Friday is the big day for the female...hopefully this will slow things down,ha, it didn't work for my husband (oops, sorry honey), so who's to say what will happen.... Anyway I'm very happy for you and your new babies. Two puppies? Think of the shoes, man. Nobody ever worries about what will happen to the shoes! They also love quilts, pillows, and especially toilet paper, we have ours on the toilet tank where the little one can't reach it. Heaven forbid if you forget to put it back. You'll know within 5 seconds.. The toilet paper must go over the top! Oh God, not again, not again!! On top of the tank? Bah! I had to keep the roll on the towel rack several feet above the toliet to keep the dog I had at the time from shreading the stuff at every given opportunity. It had to be high enough to be out of sight out of mind. Even if she couldn't get to the TP, she would go crazy jumping trying to get to it. Congrats on the new puppies, they are cute, even though I've never been a big fan of corgies. But any puppy at that age is sweet, two even more so, just to watch them play. Shadowfyre, if you find that your in over your head with those two. Let me know. 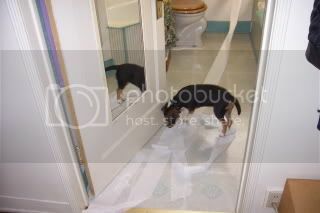 Buddy was caught in action...This was the day the toilet paper was removed from the roller and put up on tank..
Looks like Buddy had some fun.